Fig. 1. Electrical and mechanical events of a single cardiac cycle of the left heart (see text for details). ECG, electrocardiogram. Fig. 2. 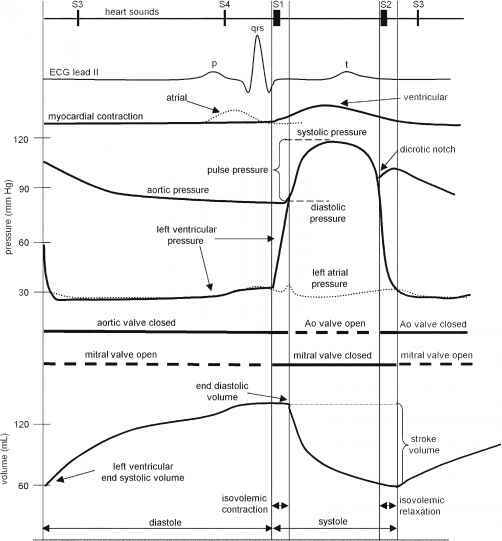 Pressure-volume diagram of a single cardiac cycle (see text for details). occurs prior to ventricular contraction. This timing delay allows for proper filling of all four chambers of the heart. Recall that the left and right heart pumps function in parallel. The diastolic phase of the cardiac cycle begins with the nearly simultaneous opening of the tricuspid and mitral valves (atrioventricular valves). The atrioventricular valves open when the pressures in the ventricles fall below those in the atria. This can be observed in Fig. 1 for the left heart, in which the mitral valve opens when the left ventricular pressure falls below the left atrial pressure. At this moment, passive filling of the ventricle begins. In other words, blood that has accumulated in the atria behind the closed atrioventricular valves passes rapidly into the ventricles, and this causes an initial drop in the atrial pressures. Later, pressures in all four chambers rise together as the atria and ventricles continue to fill passively in unison with blood returning to the heart through the veins (pulmonary veins to the left atrium and the superior and inferior vena cava to the right atrium). Contractions of the atria are initiated near the end of ventricular diastole, which is initiated by depolarization of the atrial myocardial cells (sinoatrial node). Atrial depolarization is elicited as the P wave of the electrocardiogram (Fig. 1, ECG [electrocardiogram] lead II). The excitation and subsequent development of tension and shortening of atrial cells cause atrial pressures to rise. Active atrial contraction forces additional volumes of blood into the ventricles (often referred to as "atrial kick"). The atrial kick can contribute a significant volume of blood toward ventricular preload (~20%). At normal heart rates, the atrial contractions are considered essential for adequate ventricular filling. As heart rates increase, atrial filling becomes increasingly important for ventricular filling because the time interval between contractions for passive filling becomes progressively shorter. Atrial fibrillation and/or asynchronized atrial-ventricular contractions can result in minimal contribution to preload via atrial contraction. Throughout diastole, atrial and ventricular pressures are nearly identical because of the open atrioventricular valves, which offer little or no resistance to blood flow. It should also be noted that contraction and movement of blood out of the atrial appendage (auricle) can be an additional source for increased blood volume (preload). Ventricular systole begins when the excitation passes from the right atrium through the atrioventricular node and through the remainder of the conduction system (His bundle and left and right bundle branches) to cause ventricular myocardial activation. This depolarization of ventricular cells underlies the QRS complex within the ECG (Fig. 1). As the ventricular cells contract, intraventricular pressures increase above those in the atria, and the atrioventricular valves abruptly close. Closure of the atrioventricular valves results in the first heart sound, S1 (Fig. 1). As pressures in the ventricles continue to rise together in a normally functioning heart, they eventually reach a critical threshold pressure at which the semilunar valves (pulmonary valve and aortic valve) open. The mechanical events of a single cardiac cycle and its pressure-volume relationship are displayed in Fig. 2. The normal time-period between semilunar valve closures and atrioven-tricular valve openings is referred to as the isovolumic contraction phase. During this interval, the ventricles can be considered closed chambers. Ventricular wall tension is greatest just prior to opening of the semilunar valves. Ventricular ejection begins only when the semilunar valves open. In early left heart ejection, blood enters the aorta rapidly and causes the pressure within it to rise. Importantly, pressure builds simultaneously in both the left ventricle and the aorta as the ventricular myocardium continues to contract. This period is often referred to as the rapid ejection phase. A similar phenomenon occurs for the right heart; however, the pressures developed and required to open the pulmonary valve are considerably lower. 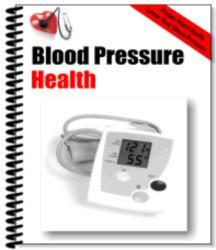 Pressures in the ventricles and outflow vessels (the aorta and pulmonary arteries) ultimately reach maximum peak systolic pressures. 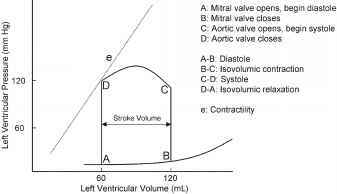 Under normal physiological conditions, the contractile forces in the ventricles diminish after achieving peak systolic pressures. Throughout ejection, there are minimal pressure gradients across the semilunar valves because of the large annular diameters. Eventually, the ventricular myocardium elicits minimal contraction to a point at which intraventricular pressures fall below those in the outflow vessels. This fall in pressures causes the semilunar valves to close rapidly. 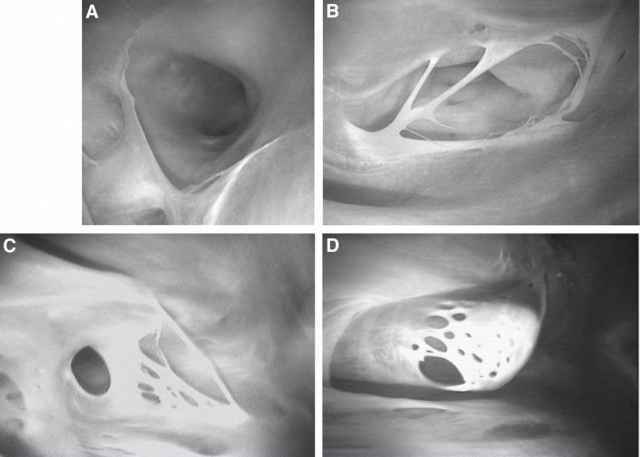 Closure of these valves is associated with the second heart sound, S2 (Fig. 1). A quick reversal in both aortic and pulmonary artery pressures is observed at this point because of backpressure filling the semilunar valve leaflets. The backpressure on the valves causes the incisura or dicrotic notch, which can be detected by local pressure recording (e.g., with a locally placed Millar catheter). After complete closure of these valves, the intraventricular pressure falls rapidly, and the ventricular myocardium relaxes. For a brief period, all four cardiac valves are closed, which is commonly referred to as the isovolumetric relaxation phase. Eventually, intraventricular pressure falls below the rising atrial pressures, the atrioven-tricular valve opens, and a new cardiac cycle is initiated.